The chief purpose of this page is to itemize Peggy Lee's appearances in other artists' albums. 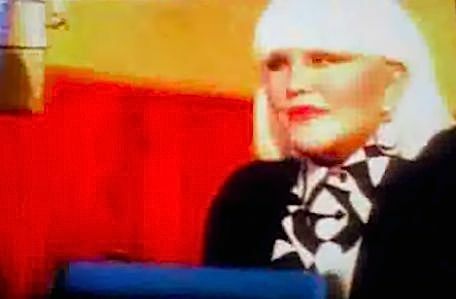 Most of such appearances have an obvious explanation: at some point during her career, Lee and the album's artist recorded together. 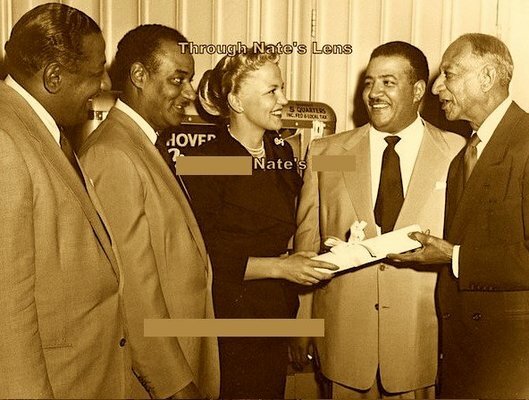 In some instances, the artist in question was a musician (e.g., Barney Bigard, Red Norvo), a conductor or a producer (e.g., Milt Gabler, Quincy Jones) who worked with Lee at a given session. 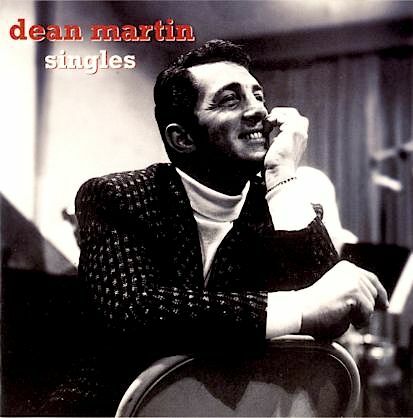 In other instances, the album's main artist was a fellow singer with whom Lee duetted (e.g., Dean Martin, Mel Tormé). It is worth noting that most of the appearances listed below can be found both in Lee's own issues and in the albums by the other artist. There are, however, a few exceptions. 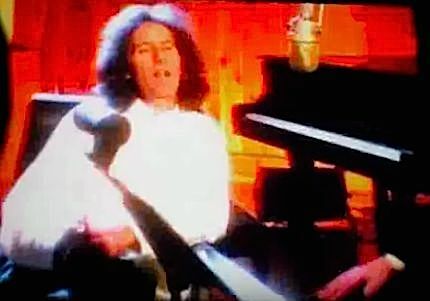 The guest spots that Lee did for albums by Benny Carter, Michael Franks, and Gilbert O'Sullivan do not appear in any of Lee's albums. They can be found only in CDs by those gentlemen. 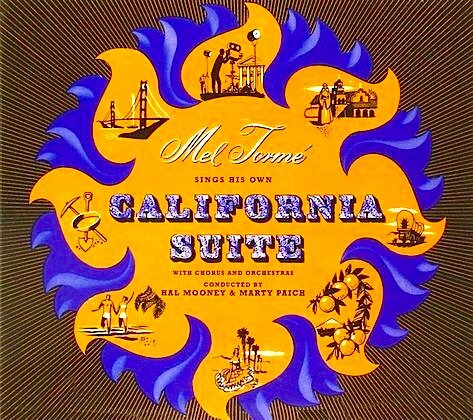 In the case of Mel Tormé's album California Suite (section X below), for which Lee sang in multiple tracks, only one track has shown up in her CDs. (Lee's singing in those other California Suite tracks is minimal and sporadic, however.) Finally, one of two instrumentals in which Peggy Lee played drums (see section XVI below) has yet to appear in any Lee issue. This page is arranged alphabetically by the artist's first name. Do also bear in mind that the page is restricted to studio recordings. Duets taped for radio and television (with the likes of Nat King Cole, Dean Martin, Jimmy Durante, Judy Garland, Frank Sinatra, etc.) have not been factored. Neither have been various-artists compilations, nor songwriter anthologies. 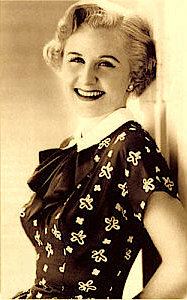 As for Peggy Lee's studio recordings with Benny Goodman and Bing Crosby, this pictorial discography features such material separately, in pages that bear Goodman's name. The images shown here feature some of the artists in whose albums Peggy Lee can be heard. 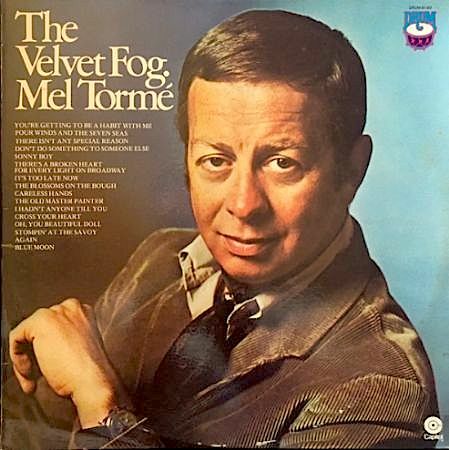 Above, Mel Tormé is one of two men with whom Lee is sharing a table. This photo dates from 1974. (The other man is drummer Buddy Rich.) 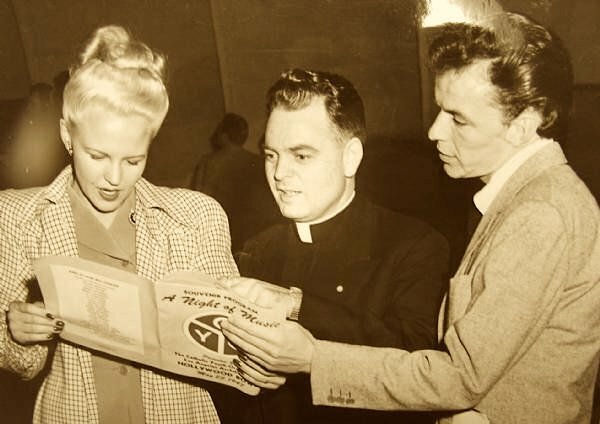 In the second photo above, Frank Sinatra and Peggy Lee hold a souvenir program. That picture was published in 1950 but is likelier to have been taken in late May of 1947, or thereabouts. (Also present in the photo is a priest and representative of the Catholic Youth Organization.) 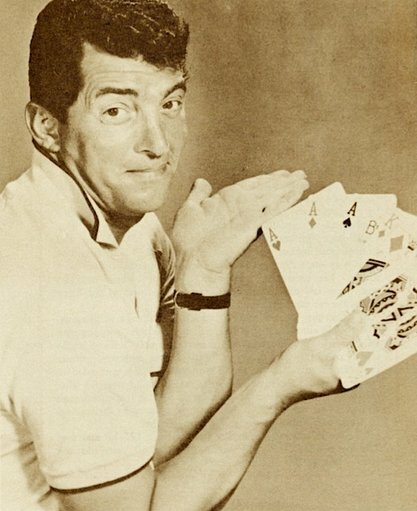 As for the artists seen in the images below, they should be easily identifiable as a young Johnny Mercer, a lucky Dean Martin holding a house-full of cards, a happy-go-lucky, brightly smiling Margaret Whiting, and the imposingly tall (6'4") redhead whose work with Lee will be further covered in the ensuing entry, Art Lund. 1. 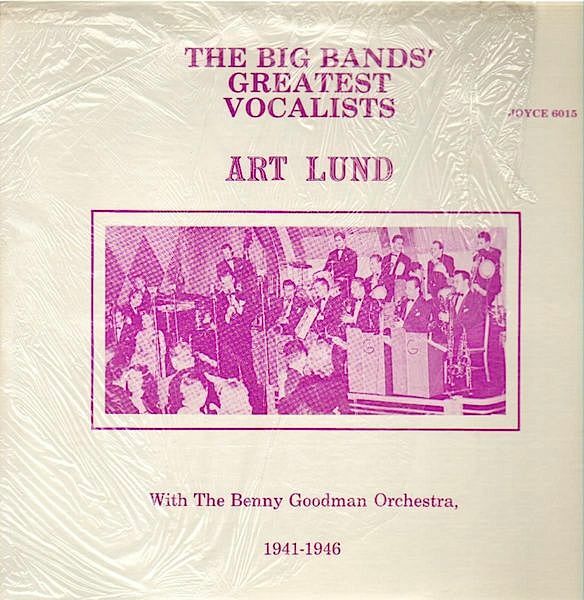 Title: Art Lund With The Benny Goodman Orchestra, 1941-1946 ("The Big Bands' Greatest Vocalists" Series) / Format: LP / Label: Joyce Record Club / Cat. Num. : 6015 / Rel. 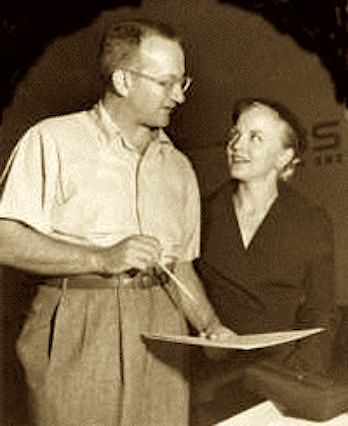 Year: unknown / Note: During a few of the months which Peggy Lee spent as the "girl singer" of The Benny Goodman Orchestra, Art Lund served duty as her counterpart, the "boy singer." 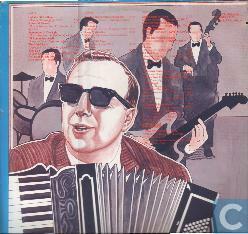 The pair is shown in the photo that graces the front cover of this LP (image #1). They can be seen on the left side of the picture, sitting down near the pianist while waiting for their spots. (Dancers are up front, the band on the back.) This Joyce Record Club LP includes two duets that Lund and Lee recorded with Goodman for Columbia: "Winter Weather" (1941) and "If You Build A Better Mousetrap" (1942). Both numbers are also available in various Peggy Lee - Benny Goodman anthologies, including the 1999 2CD set Peggy Lee & Benny Goodman; The Complete Recordings, 1941-1947. 2. Title: Band Singer; The Best Of Art Lund / Format: CD & CS / Label: Collectors' Choice / Cat. Num. : Ccm 153 2 (also A 31705) & unknown / Rel. Year: 2000 / Note: Though not a reissue nor directly connected in any way to the aforementioned LP, this CD contains the same two duets mentioned in entry #1. 3. Peggy Lee and Art Lund, sitting on the bandstand, probably photographed in November of 1942 at the Terrace room of the New Yorker Hotel. 1. 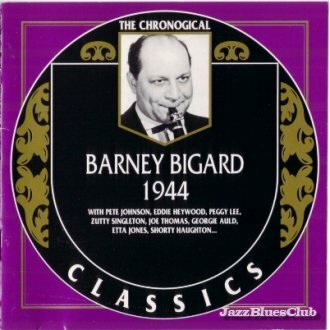 Title: The Chronogical Barney Bigard, 1944 / Format: CD / Label: Classics / Cat. Num. : (France) 896 / Rel. 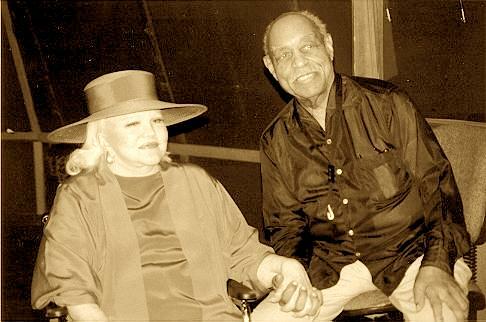 Year: 1997 / Note: Clarinetist Barney Bigard and vocalist Peggy Lee crossed paths at the recording sessions that producer Dave Dexter Jr. set up for his concept album New American Jazz. This CD includes the two numbers sung by Lee during one of those Capitol sessions, "That Old Feeling" and "Ain't Goin' No Place" (1944). Both numbers are also available in numerous Peggy Lee anthologies. 2. This 1944 photo features the artists who participated in the recording of "That Old Feeling" and "Ain't Goin' No Place," Peggy Lee included. Bigard is seen in the back, staring at the camera (third from left). 1. 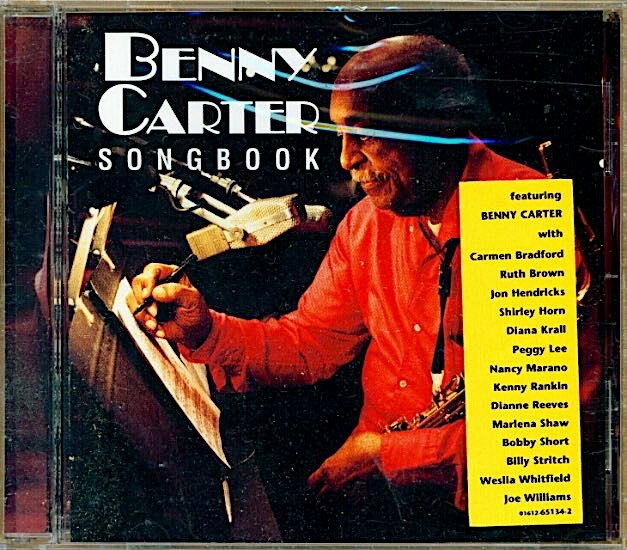 Title: The Benny Carter Songbook, Volume 1 / Format: CS & CD / Label: MusicMasters / Cat. Num. : 01612 65134 4/2 (also 01612 65172) / Rel. 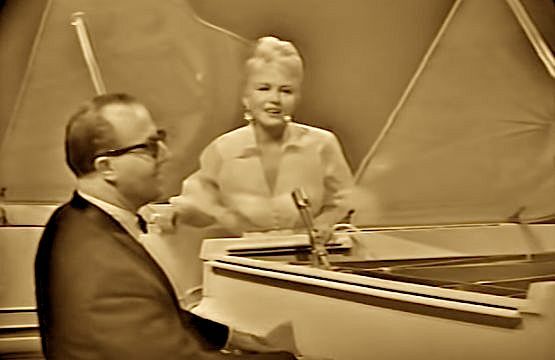 Year: 1996 / Note: After a long career as a recording artist, Peggy Lee's swan song turned out to be "I See You," the guest vocal that she did in 1995 for this all-vocals digital tribute to Benny Carter. Notice that this CD is the only issue in which Lee's appearance can be found; It is not in any of her CDs. MusicMasters actually released two volumes of The Benny Carter Songbook; Lee is featured only in the first. For extensive detail about this project, consult notes under session dated August 26, 1995, near the end of this page. 2. 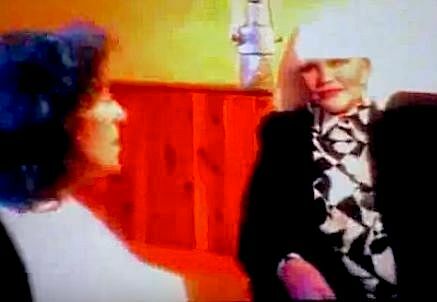 Photo of Benny and Peggy, taken during the recording session. 2. 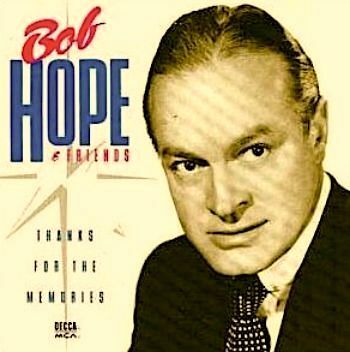 Publicity photo promoting Bob Hope's I Never Left Home, which was Capitol first release in the category of comedy albums (1946). 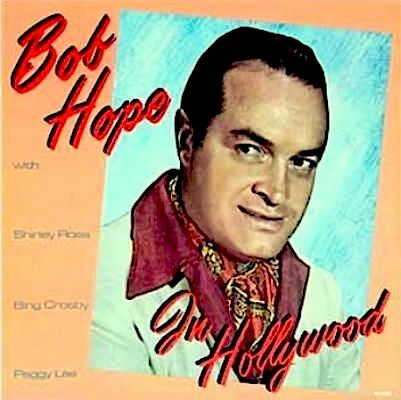 The album contains routines that Hope had performed at the Armed Forces Radio network, for the entertainment of American troops. In this tongue-in-cheek shot, Hope is being released from the box in which he was delivered to Capitol, as part of a c.o.d. transaction that the company is bound to honor -- or so Hope hopes. Those unpacking the delivered good(s) are Capitol president Glenn Wallichs, Capitol A&R vice-president Jim Conkling and, perhaps in the role of Secretary of Affairs, Peggy Lee. 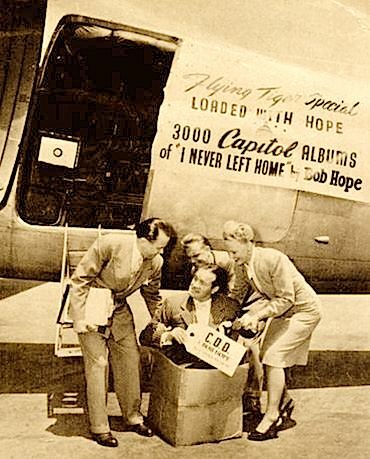 As for the chartered DC-4, it was an integral part of Capitol's substantial promotion for this album: an airliner was sent out to fly to major American cities, where it would "drop" -- in reality, just advertise and deliver -- it load of Hope-full albums. 3. Title: Thanks For The Memories / Format: CD / Label: MCA / Cat. Num. : 10611 / Rel. Year: 1992 / Note: Contains the same number mentioned in entry #1. Merry-Go-Runaround" actually appears in a large number of Bob Hope compilations. Most of them are from Public Domain releases, and quite a few are named after the standard "Thanks For The Memory," which he co-introduced. Herein I have listed, as a sample, only two official compilations from the Decca-MCA-Universal family. A larger pictorial gallery can be found in the Road To Bali section of this discography Crosby-Lee Recordings page. Of course, "Merry-Go-Runaround" can also be found in Peggy Lee's own anthologies. 1. 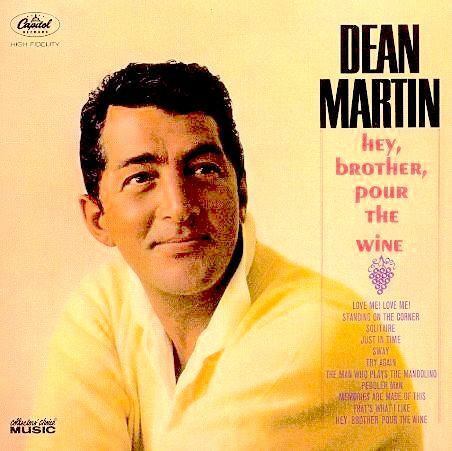 Title: Hey, Brother, Pour The Wine / Format: CD / Label: Collectors' Choice / Cat. Num. : Ccm 609 2 (also 09463 43383 2 5) / Rel. 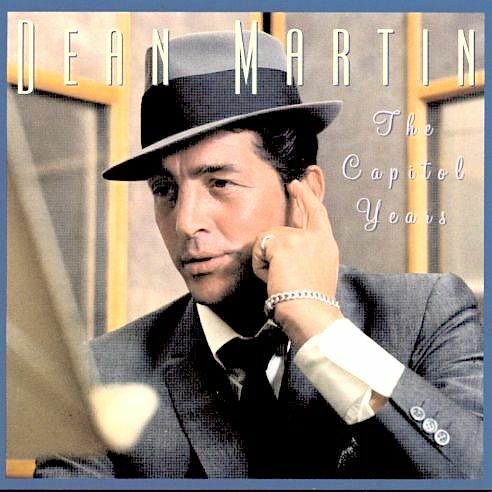 Year: 2006 / Note: This licensed CD edition of the Capitol LP Hey, Brother, Pour The Wine includes the Peggy Lee-Dean Martin duet "You Was" among its bonus tracks. 2. 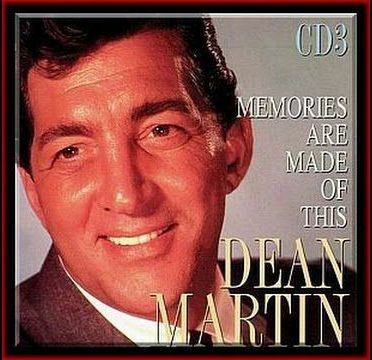 Title: The Best Of Dean Martin / Format: CD / Label: Emi's Music For Pleasure / Discs: 3 / Cat. Num. : (United Kingdom) Cdtr Box 288 (also 7243 8 59812 2 7) / Rel. 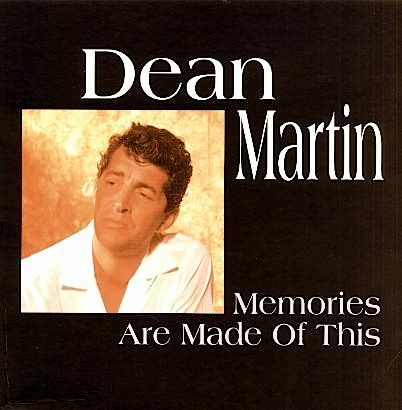 Year: 1997 / Note: The Lee-Martin duet "You Was" is on the third disc of this 48-track set. 3. 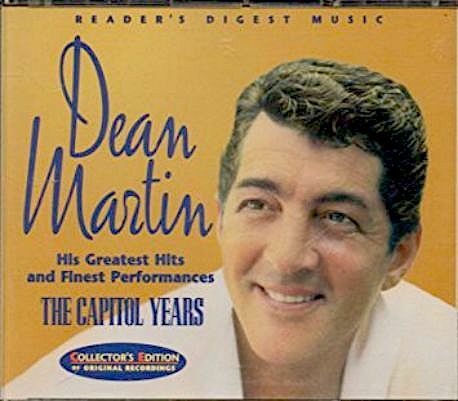 Title: The Capitol Years ("Greatest Hits And Finest Performances" Series) / Format: CD / Label: Reader's Digest / Cat. Num. : (United Kingdom) 113C / Rel. Year: 1997 / Note: This British retrospective contains 60 tracks. The full program is divided under several sections, each with its own distinctive name. "You Was" can be found under a small, five-track section called Dean ... With The Ladies. 4. Title: The Capitol Years / Format: CD / Label: Capitol / Cat. Num. : 0777 7 98409 2 2 / Discs: 2 / Rel. Year: 1997 / Note: Arguably the best Martin anthology ever issued by Capitol itself, this American set positions "You Was" as the third number in the entire 40-track program. "Memories Are Made Of This" and "Powder Your Face With Sunshine" are the selections that precede "You Was." 5. Title: Memories Are Made Of This / Format: CD / Label: Bear Family / Cat. Num. : (Germany) Bcd 15781 HK / Discs: 8 / Rel. Year: 1997 / Note: The first of Bear Family's four boxes featuring Martin's entire record catalogue, this chronologically arranged release concentrates on his 1946-1955 period. 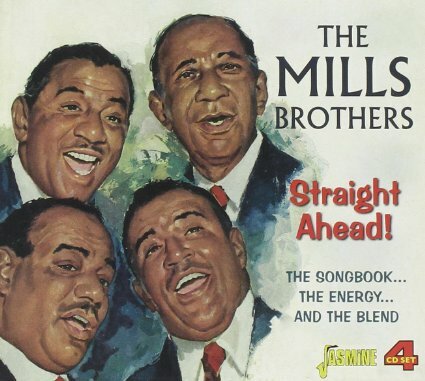 Hence its inclusion of the duet "You Was," which Martin and Lee recorded in 1949. 7. 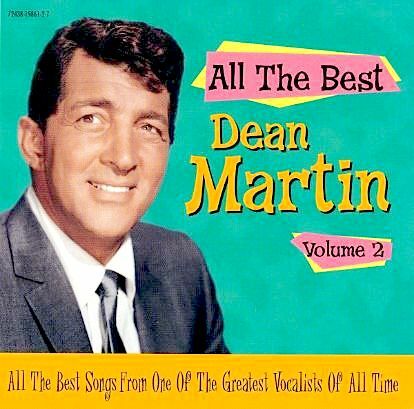 Title: All The Best, Volume 2 / Format: CD & CS / Label: Emi-Capitol Special Markets / Cat. Num. : 7243 8 19861 2 7 & 7243 8 19861 4 1 / Rel. 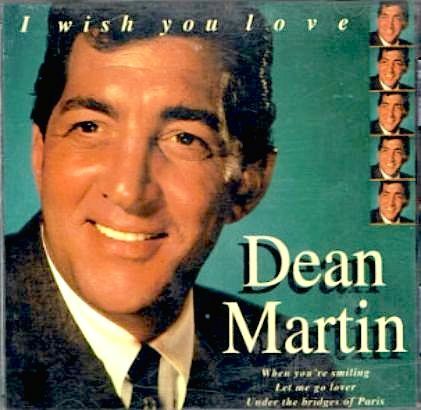 Year: 1998 / Note: As with all other entries under this section dedicated to Dean Martin issues, this 20-track set contains the Peggy Lee-Dean Martin duet "You Was." 9. Title: Memories Are Made Of This [CD 3] / Format: CD / Label: Disky Cat. Num. : (Netherlands) Bx 883312 / Rel. Year: 1996 / Note: This is actually the third disc of a Disky set that will be profiled next. However, any of the set's discs arguably merits its own listing, due to the fact that they have been sold not only as part of their set but also separately. 10. Title: Memories Are Made Of This ("Golden Sounds" Series) / Format: CD / Label: Disky Cat. Num. : (Netherlands) Sa 872662 & (Australasia) 4 87266 2 / Discs: 3 / Rel. Year: 1996 / Note: The regular Dutch boxed edition is pictured above. In Australia and Asia, a longbox packaging was favored. "You Was" is on the third disc; see also preceding entry. 11. Title: Singles / Format: CD / Label: Emi Music for Pleasure / Cat. Num. : (United Kingdom) 7243 8 30296 2 4 / Rel. Year: 1994 / Note: Original digital issue of a compilation which -- like many releases from Music For Pleasure -- has enjoyed a healthy reissue history. A 2001 reissue on Emi Gold and a reissue on Disky have already been covered in preceding entries. There were also editions pressed in Argentina (1996) and South Africa (2001), those one sporting the front cover as the Emi Gold edition. 12. 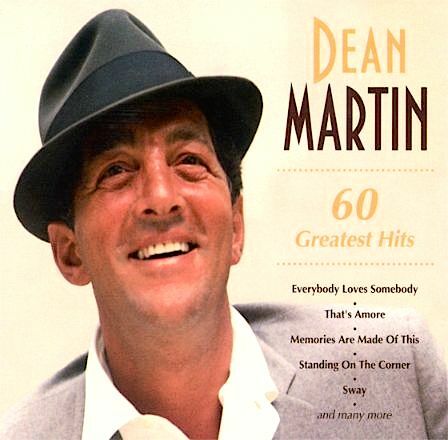 Title: 60 Greatest Hits / Format: CD / Label: Capitol & Star Mark / Cat. Num. : (Russia) 4607147906439 28628 / Discs: 2 / Rel. Year: 2011 / Note: Includes not only vintage duets with Peggy Lee, Margaret Whiting, and Nat King Cole but also an electronically created combination of Martin with Martina McBride, singing "Baby, It's Cold Outside." 13. 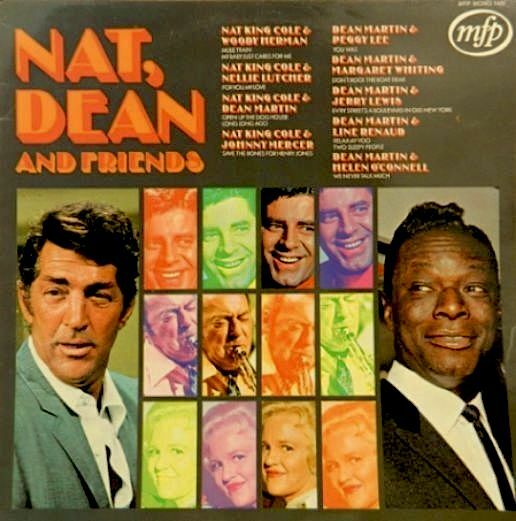 Title: Nat, Dean And Friends / Format: LP / Label: Music For Pleasure / Cat. Num. : (United Kingdom) Mfp 1432 & (Netherlands) Mfp 5198 / Rel. 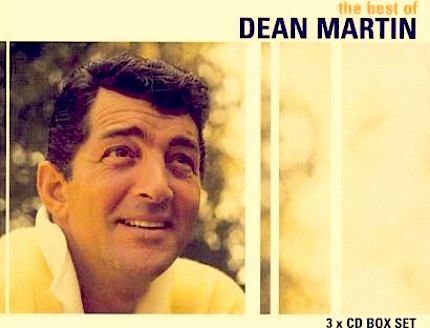 Year: 1968 (UK) / Note: This Alan Dell-prepared EMI compilation offers duets that either Dean Martin or Nat King Cole recorded with their Capitol labelmates. Hence "You Was," sung by Martin with Peggy Lee, is included. (Lee also duetted with Cole, but only on radio, not in the Capitol studios.) The front cover features shots of not only Martin and Cole but also Jerry Lewis, Woody Herman, and Peggy Lee. 14. 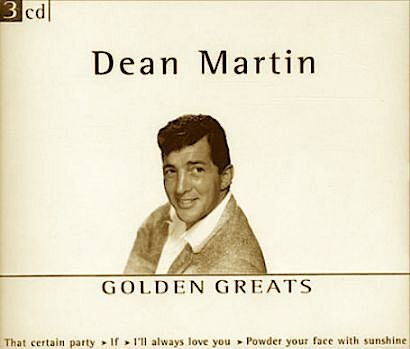 Title: Dean Martin ("Golden Greats" Series) / Format: CD / Label: Disky / Cat. Num. : (Netherlands) Mp 791802 / Discs: 3 / Rel. Year: 2002 / Note: 'You Was" is among the 60 tracks on this licensed set from Disky's "Golden Greats," whose insipid artwork provides a clue as to its budgetary orientation. 15. 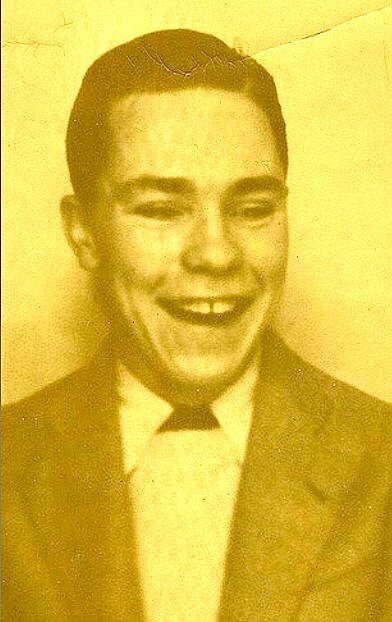 From 1949, this photograph was part of the promotional publicity for the original Capitol release of "You Was" (a single). 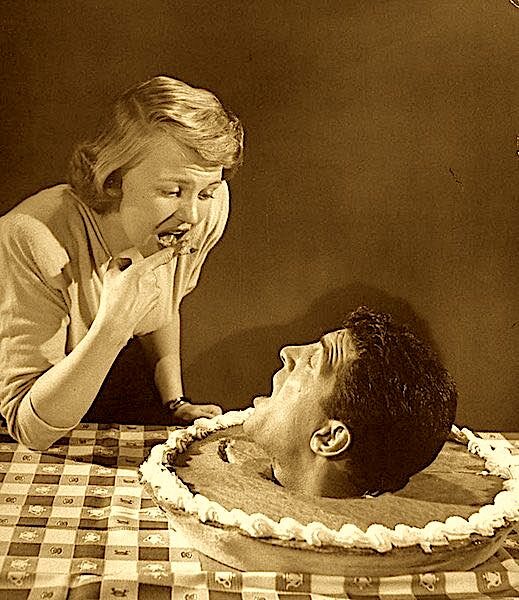 In the photo, a sweetly game Dean Martin and a suitably shocked Peggy Lee offer a very literal reenactment of one of the song's lines. 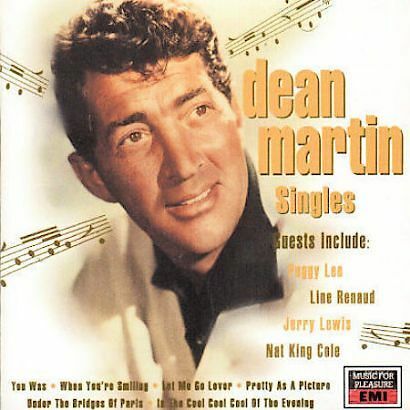 Originally released as 78-rpm Capitol single 15349, "You Was" has been frequently reissued in official Dean Martin anthologies and, to a lesser degree, in official Peggy Lee anthologies. Public Domain labels have reissued the duet even more persistently, making it ubiquitous. 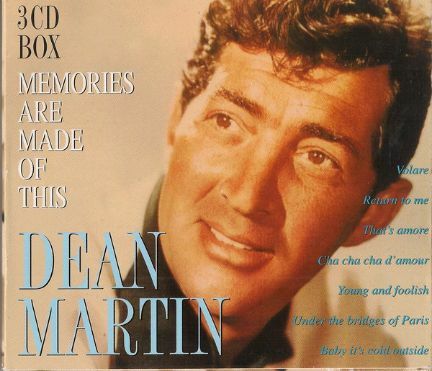 The present section is circumscribed to official Dean Martin releases, whether from the original owning label (Capitol-Emi) or from branches and licensees (Emi Gold, Disky, Reader's Digest, et cetera). The listing should be deemed comprehensive, with qualifying additions to be made in the future, as I come across them. Peggy Lee and Frank Sinatra worked together on radio and television. They also joined forces in the making of The Man I Love, one of her Capitol LPs. For a pictorial overview of The Man I Love, go to this gallery's Capitol Albums page (section IV). As for their work in the media, two additional pages depict the DVD, VHS, and audio-only transfers in existence: Radio Broadcasts (section IX) and TV Guest Appearances (section XV). The present page is more oriented toward guest and duet studio recordings, of which there are none by the combined forces of Lee and Sinatra. 1 & 2. 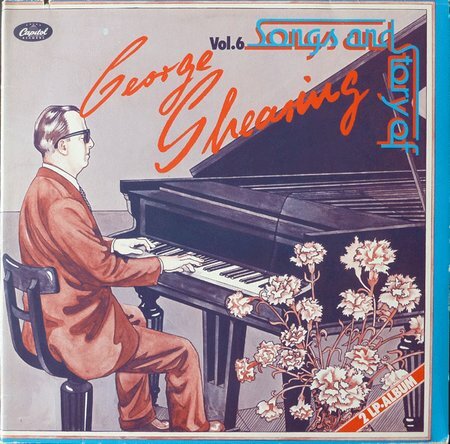 Title: Songs And Story Of George Shearing, Volume 6 / Format: LP / Label: Capitol / Cat. Num. : (Germany) 134 Evc 85 232-233 / Rel. Year: 1980 / Volumes or Discs: 2 / Note: Contains two tracks from the 1959 Peggy Lee-George Shearing album Beauty And The Beat. The tracks are "If Dreams Come True" and "Always True To You In My Fashion." 3. 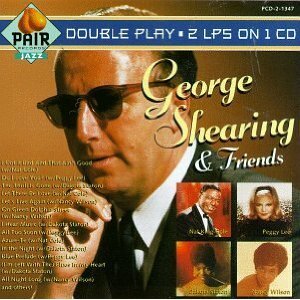 Title: George Shearing & Friends / Format: CD / Label: Pair / Cat. Num. : Pdcd 2 1347 / Rel. Year: 1995 / Note: This licensed compilation includes five more tracks from the Lee-Shearing album Beauty And The Beat. The tracks are "Do I Love You?," "Get Out Of Town," "All Too Soon," "There'll Be Another Spring," and "Blue Prelude." 4. 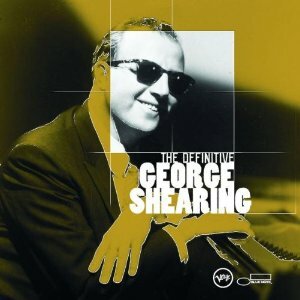 Title: The Definitive George Shearing / Format: CD / Label: Blue Note & Verve / Cat. Num. : 589857 / Rel. Year: 2002 / Note: Contains "You Came A Long Way From St. Louis," another track from the album Beauty And The Beat. 5. 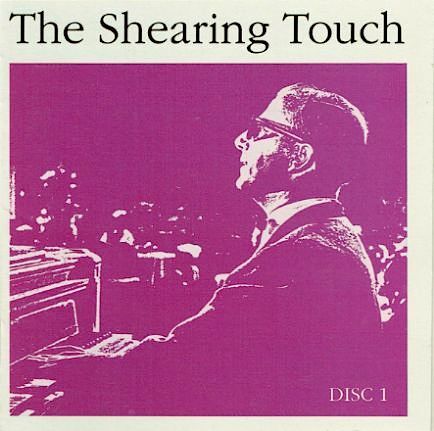 Title: The Shearing Touch / Format: CD / Discs: 3 / Label: Sequel Jazz / Cat. Num. : Nxt Cd 173 / Rel. Year: 1991 / Note: Not to be confused with the popular Capitol album of the same name, this licensed set contains two tracks from the Lee - Shearing album Beauty And The Beat. The tracks are "If Dreams Come True" and "All Too Soon." This release shares with the above-mentioned Pair CD an inclusion of numerous tracks from Shearing's collaborations with Capitol vocalists. 6. 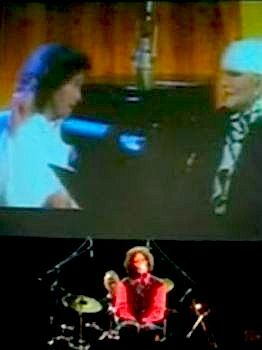 Screenshot of Shearing and Lee performing together in 1959 (a television). 1 & 2. Title: Can't Think Straight / Format: CD Single / Label: Park / Cat. Num. : (United Kingdom) Parkcd 15 / Rel. 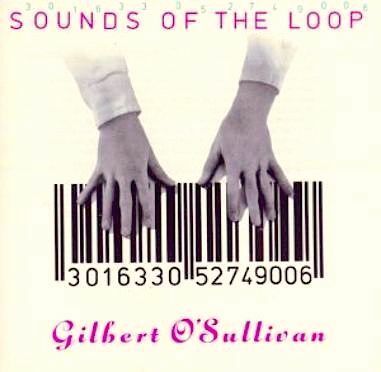 Year: 1992 / Note: Consisting of three tracks, this CD single describes itself as an advance sample from the album Sounds Of The Loop (pictured below). Although its front cover gives equal billing to both singers, Peggy Lee is actually a guest vocalist, participating in only one of the three tracks, the titular "Can't Think Straight." O'Sullivan sings solo in the other two numbers. 3. Title: Sounds Of The Loop / Format: CS & CD / Label: Park / Cat. Num. : (United Kingdom) Parkmc 19 & Parkcd 19 / Rel. Year: 1993 / Note: Includes Peggy Lee's aforementioned collaboration with Gilbert O'Sullivan, "Can't Think Straight." Also includes a second version of "Can't Think Straight," in which O'Sullivan collaborates with a different artist, Takao Kisugi. On a separate albeit related note, it is wort pointing out that Sounds Of The Loop was an international release, officially issued in at least four countries (Denmark, Italy, Japan, United Kingdom). Those various editions are not identical, nor do they all feature Peggy Lee. In fact, Lee is not heard in the Japanese and Danish editions. She is heard, on the other hand, in the Italian edition (Nota Blu 9409288), which is essential another pressing of the British item under inspection. Hence that Nota Blue CD and this Park CD use the same front cover artwork and count with Peggy Lee's vocals. For further details, consult notes under entries #5 & #6. 4. 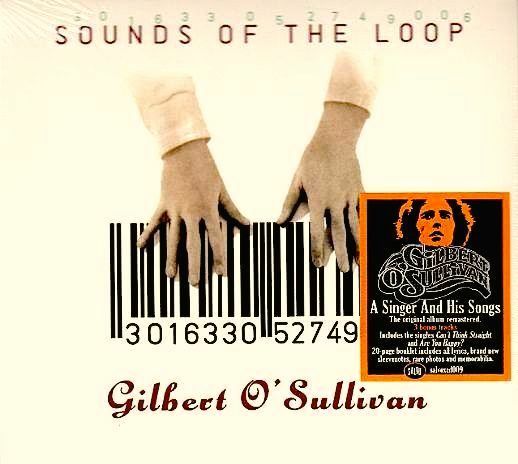 Title: Sounds Of The Loop / Format: CD / Label: Union Square Music's Salvo / Cat. Num. : (United Kingdom) Salvoxcd 009 / Rel. Year: 2013 / Note: Reissue of the preceding 12-track item, with three so-called bonus tracks. 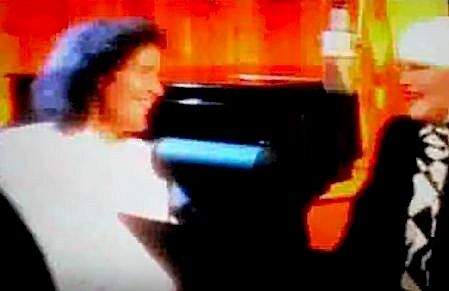 Among such bonuses is yet a third version of "Can't Think Straight," for which O'Sullivan recruited a celebrity from Spain, actress and sometime singer Silvia Tortosa. 5. Title: Sounds Of The Loop / Format: CD / Label: Toshiba Emi's Inside Out / Cat. Num. : (Japan) Tocp 6897 / Rel. Year: 1991 / Note: Pictured and showcased herein only for clarification purposes, this item does not feature Peggy Lee. 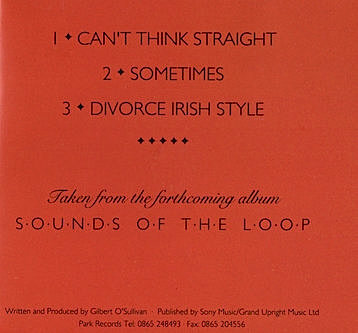 It is actually the original, earliest edition of the album Sounds Of The Loop, even though the primary, official edition is the 1992 British edition on Park Records (entry #3). Its version of "Can't Think Straight" presents O'Sullivan in the company of the Japanese pianist, singer and songwriter Takao Kisugi. Additional differences between the British and Japanese editions are discussed here, under the session dated August 2, 1992. 6. Title: Sounds Of The Loop / Format: CD / Label: Scandinavian Records / Cat. Num. : (Denmark) 966 005 2 / Rel. Year: 1993 / Note: Pictured and showcased herein only for clarification purposes, this item does not feature Peggy Lee. Instead, its version of "Can't Think Straight" presents O'Sullivan in the company of the Danish singer and Theater actress Kirsten Siggaard. 7. Title: The Essential Collection / Format: CD / Discs: 2 / Label: Union Square Music / Cat. Num. : (United Kingdom) Usmtvcdd 013 / Rel. Year: 2016 / Note: Possibly the most up-to-date overview of O'Sullivan's musical career, this anthology features highlights handpicked by the singer-songwriter himself. One of them is his "Can't Think Straight" partnership with Peggy Lee. 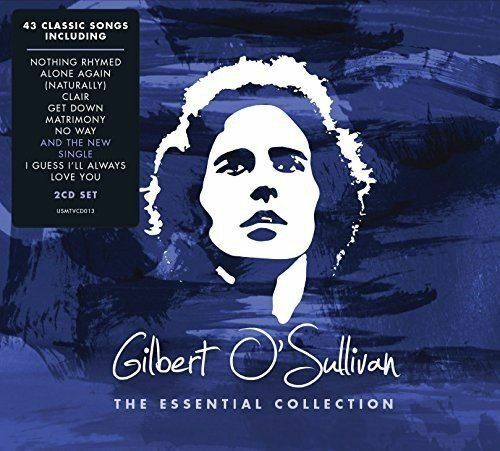 Prospective buyers should be made aware of the fact that this 2016 Essential Collection is actually a vastly expanded reissue of the 2012 CD The Very Best Of Gilbert O'Sullivan; A Singer And His Songs, released by the same label. (Incidentally, Union Square Music was purchased by BMG in 2014.) The earlier CD release offered a 22-track program, with no version of "Can't Think Straight" in the mix. 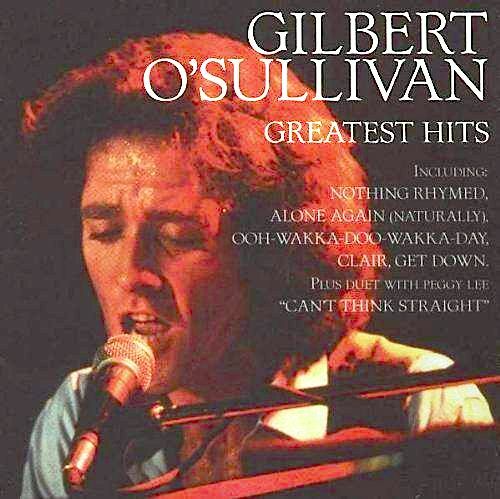 This 2CD set rectifies the situation by including the O'Sullivan-Lee take on "Can't Think Straight" among over 20 freshly added tracks. 8. 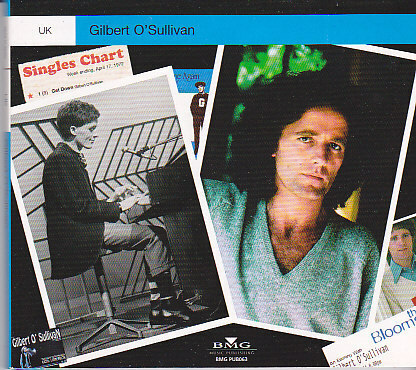 Title: Gilbert O'Sullivan / Format: CD / Label: Bmg / Cat. Num. : (United Kingdom) Pub 063 / Rel. 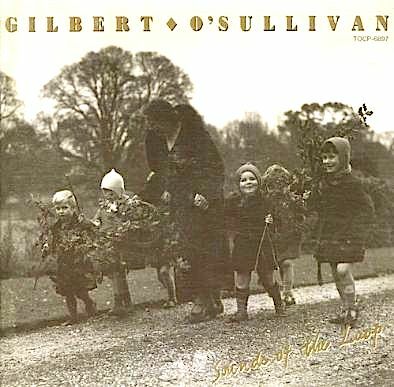 Year: 2005 / Note: A non-retail, promotional disc of O'Sullivan compositions, prepared by the BMG Music Publishing company. 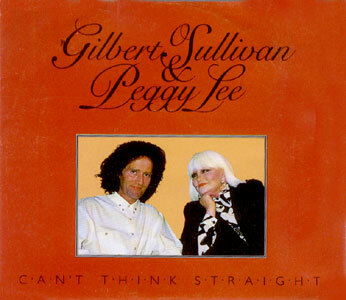 All but two of the 17 tracks are interpreted by O'Sullivan himself, and one of them is his "Can't Think Straight" collaboration with Peggy Lee. This CD marked the debut release of the Pet Shop Boys-Elton John cover of O'Sullivan's "Alone Again (Naturally)." 9. 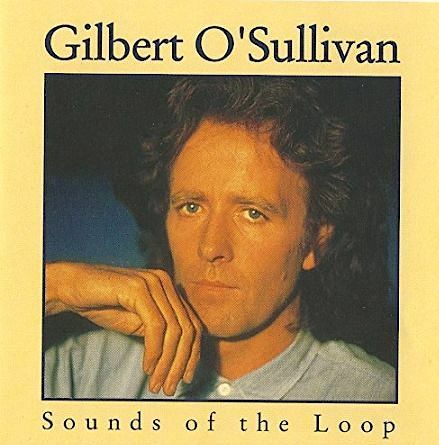 Title: The Berry Best Of Gilbert O'Sullivan / Format: CD / Label: Capitol / Cat. Num. : (United Kingdom) 5986722 / Rel. Year: 2004 / Note: Emi picked the O'Sullivan-Lee version of "Can't Think Straight" for inclusion on this 21-track collection, which also features dance/radio-friendly remixes of a couple of songs. 10. Title: Caricature; The Box / Format: CD / Label: Rhino Handmade / Cat. Num. : Rhm 2 7849 / Disc: 3 / Rel. Year: 2004 / Note: Probably the most extensive retrospective of O'Sullivan career, consisting of 73 tracks. Issued in the United Kingdom on an O'Sullivan imprint named Bygum Records (#120). Contains the version of "Can't Think Straight" with Peggy Lee collaborating on vocals. 11. 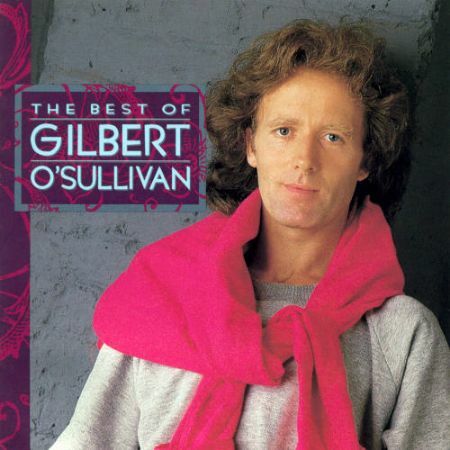 Title: The Best Of Gilbert O'Sullivan / Format: CD / Label: Rhino / Cat. Num. : R2 70560 / Rel. Year: 1997 / Note: 20-track collection which includes "Can't Think Straight" in the version sung by O'Sullivan with Peggy Lee. According to word of mouth, Rhino had originally used instead the version with Kirsten Siggaard. For that reason, a displeased O'Sullivan requested the recalling of the CD's first pressing, and the replacement with the the Peggy Lee version. 12. 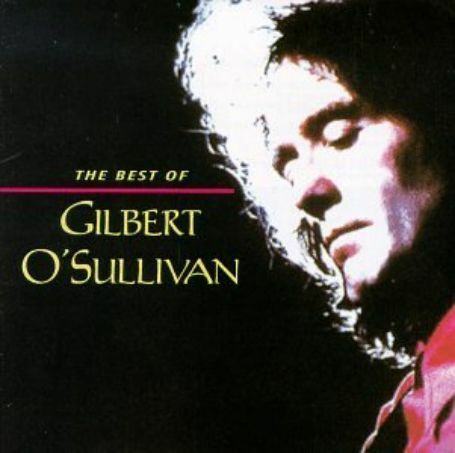 Title: The Best Of Gilbert O'Sullivan / Format: CD / Label: Rhino / Cat. Num. : R2 70560 / Rel. Year: 1991 / Note: Pictured and showcased herein only for clarification purposes, this item does not feature Peggy Lee. It is actually Rhino's original issue of the Best Of CD that the label would go on to reissue in 1997 (preceding entry). The front cover ante release year are different but the title and catalogue number are the same. Of the 20 tracks, the only different ones are #12 ( "A Very Extraordinary Sort of Girl" in this 1991 outing, "At The Very Mention Of Your Name" in the 1997 reissue) and #17 ("Christmas Song" in this outing, "Can't Think Straight" in the reissue). 13. 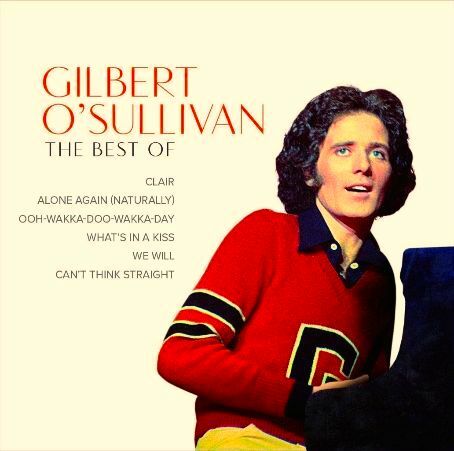 Title: The Very Best Of Gilbert O'Sullivan ("Start TV-CD" Series) / Format: CD / Label: Scana / Cat. Num. : (Sweden) Star 2000 2 / Rel. Year: 1996 / Note: On the back cover, "Can't Think Straight" (track #13) is identified as a "[d]uet with Miss Peggy Lee." 14. 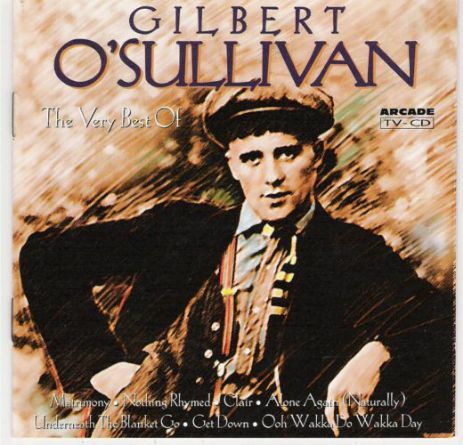 Title: The Very Best Of Gilbert O'Sullivan / Format: CD / Label: Arcade / Cat. Num. : (Netherlands) 01 9080 6 & (Germany) 9902257 / Rel. Year: 1995 / Note: On the back cover, "Can't Think Straight" (track #15) is identified as a "[d]uet with Miss Peggy Lee." 15. 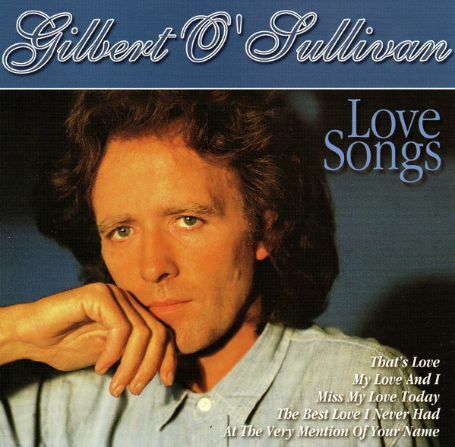 Title: Gilbert O'Sullivan / Format: CD / Label: Falcon Neue Medien / Cat. Num. : (Germany) 4189 / Rel. Year: 2004 / Note: Said to contain the Lee-O'Sullivan interpretation of "Can't think Straight." Confirmation needed. 16. 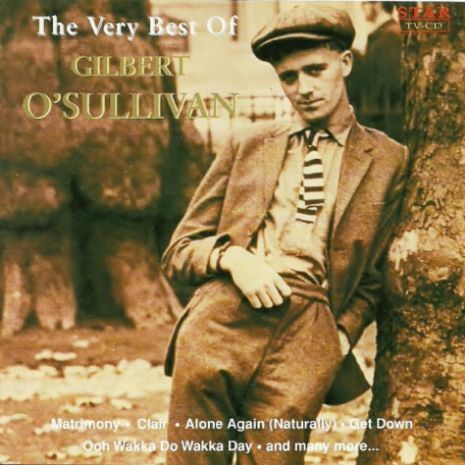 Title: the Very Best Of Gilbert O'Sullivan / Format: CD / Label: Pan Music & Entertainment / Cat. Num. : (Greece) 00 1101 Pm / Rel. Year: unknown; possibly 2003 / Note: On the back cover, "Can't Think Straight" (track #13) is identified as a "[d]uet with Miss Peggy Lee." 17. Title: Love Songs / Format: CD / Label: Music Wave / Cat. Num. : (Netherlands) Mw 031 / Rel. Year: 2002 / Note: On the back cover, "Can't Think Straight" (track #18) is identified as a "[d]uet with Peggy Lee." 18. 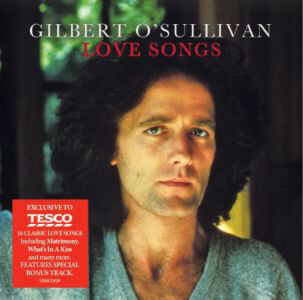 Title: Love Songs / Format: CD / Label: Union Square Music & Tesco / Cat. Num. : (United Kingdom) Usmcd 029 / Rel. Year: 2013 / Note: "Can't Think Straight" is the 4th track on this 16-song collection. Online sites such as Amazon identify it as the version featuring Peggy Lee. 19. Title: Greatest Hits / Format: CD / Label: Repertoire / Cat. Num. : (Germany) Rep 4260Wz / Rel. Year: 1996 / Note: The front cover list five of O'Sullivan's hits, plus duet with Peggy Lee, "Can't Think Straight." 20. 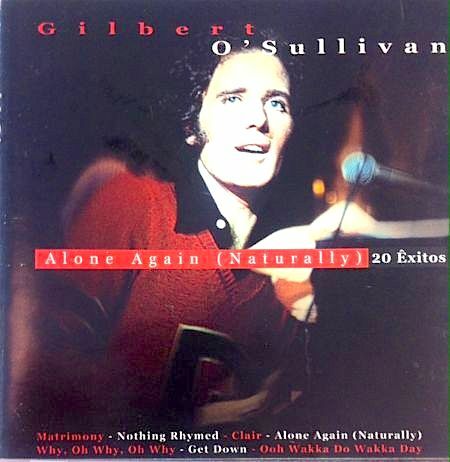 Title: Alone Again (Naturally) / Format: CD / Label: Som Livre / Cat. Num. : (Portugal) Sl 0248 2 / Rel. Year: 1999 / Note: On the back cover, "Can't Think Straight" (track #8) is called a "dueto com Peggy Lee." 21. 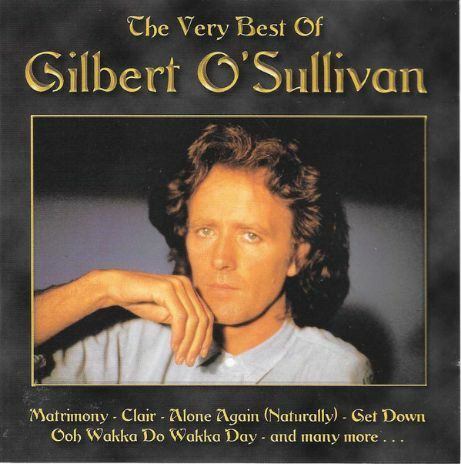 Title: The Best Of Gilbert O'Sullivan / Format: CD / Label: Salvo / Cat. Num. : (United Kingdom) Imt 5019224.2 (also 0698458940728) / Rel. Year: 2015 / Note: The front cover list six of O'Sullivan's numbers, the last one being "Can't Think Straight." Confirmation that this is the version with Peggy Lee is needed. 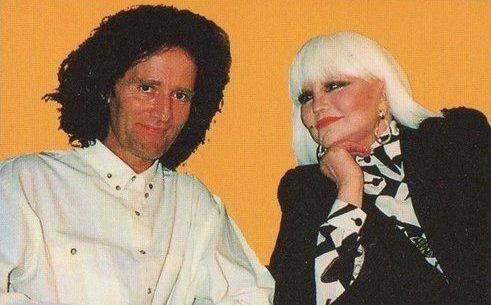 Seen immediately above is a larger version of the photo that was used as the front cover of Park's CD single Can't Think Straight. This image was probably doctored. It actually looks like a composite of two separate shots (one showing O'Sullivan, one showing Lee), with a blank orange backdroo substituting for the original background(s). These alterations could potentially lead us into assuming that O'Sullivan and Lee did not meet, and hence the pasting together of their separate portraits. Such an assumption would be incorrect on our part, however. As we will shortly see, the two stars did meet face to face, and sang together as well. The photographic alterations at issue were dictated merely by the cosmetic mandates to which the designer's of this CD single subscribed. 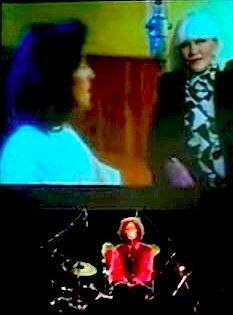 All the supplied snapshots come from YouTube clips, which are in turn videotapings of Gilbert O'Sullivan concerts. A clearer explanation might be in order. Starting around 2009, O'Sullivan's concert appearances began to feature a segment in which the artist reminisced about the time he spent recording his self-penned composition with Peggy Lee. The Irish singer-songwriter would tell concert audiences about how he had invited the American singer-songwriter to do a recording together, and how she had accepted. After the reminiscence, the video would be played at the given concert venue, on a large screen in the background. 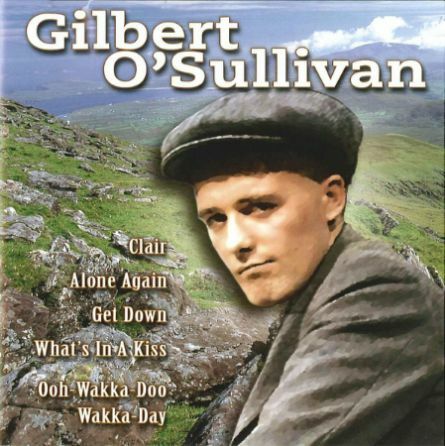 As the video would go along, O'Sullivan would join its audio, in a fresh sing along of his part of the lyrics. For additional details, consul this Peggy Lee sessiongraphy, under session dated ca. August or September 1992. 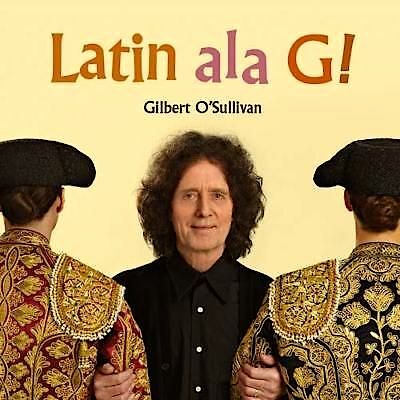 In 2015, Gilbert O'Sullivan released his CD Latin Ala G, a collection of self-penned songs with a latin lilt. According to promotional blurbs and press reports, Peggy Lee's latinized work (particularly the albums Latin Ala Lee and Olé Ala Lee!) 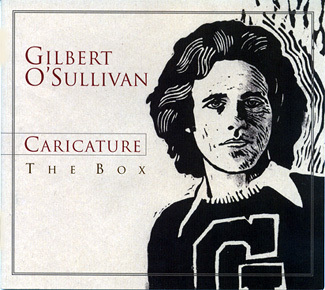 served as O'Sullivan's inspiration for the album's concept, title, and artwork. In an interview published on the June 12, 2015 issue of Ireland's Own, O'Sullivan explained: "It was an honor to duet with Peggy in the early 1990s, and my new album is a homage to her. The cover of the album is a reproduction of one of her albums in the 1960s, Latin Ala Lee. On it she is pictured linking arms with two male matadors. 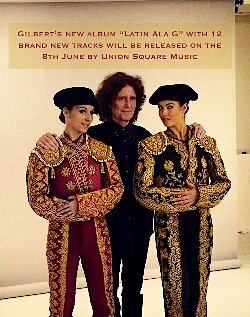 I'm doing the opposite on the new album cover, linking arms with two female matadors." 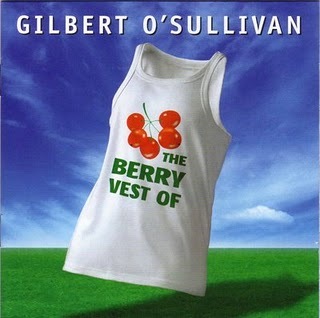 The front cover of the O'Suilivan release is pictured in the second of the three images above. The other two images are session photos. The compact disc was released by Bmg's Union Square Music in the United Kingdom (Usmflcd 002) and by Victor in Japan (vicp 75149). 1. 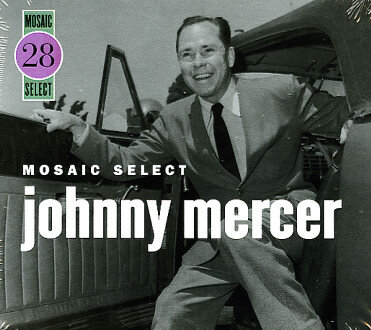 Title: Johnny Mercer ("Mosaic Select" Series) / Format: CD / Label: Mosaic / Cat. Num. : Ms 028 (also 946 3 90562 2 4) / Volumes: 3 / Rel. Year: 2007 / Note: In this anthology of mostly jazzy sides from Johnny Mercer's years as a Capitol vocalist, there are two tracks that bear a direct connection to Peggy Lee. One of them is a 1947 pop-oriented recording of Irving Berlin's "The Freedom Train" in which Mercer and Lee are but two members of the Capitol roster who sings the number. "The Freedom Train" can also be found in Peggy Lee anthologies and, as shown elsewhere through this page, in compilations by some of the other artists who were part of the session's personnel. The other track connected to Lee in this Mercer collection i "It's A Good Day," a song whose lyrics were written by Peggy Lee, and which Mercer (Lee's songwriting mentor) recorded in 1945. 2. 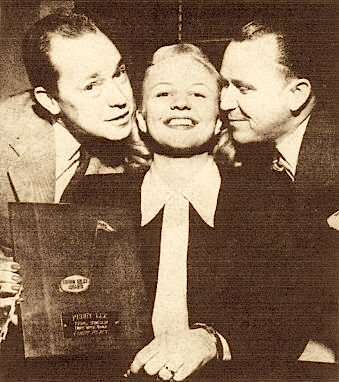 Taken shortly after Downbeat magazine declared Peggy Lee the winner on its Best Female Singer poll for the year 1946, this photo shows the vocalist in the company of her two main bosses at Capitol Records, Johnny Mercer and Glenn Wallichs. 1. 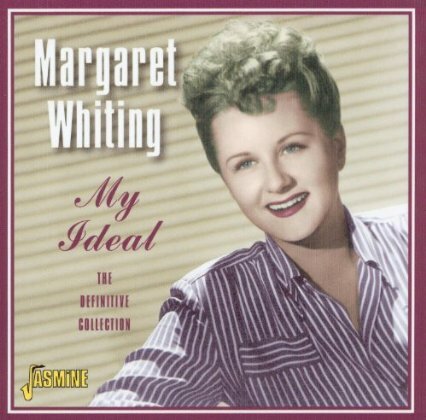 Title: My Ideal; The Definitive Collection / Format: CD / Label: Jasmine / Cat. Num. : (United Kingdom) 174 / Rel. Year: 2007 / Volumes: 3 / Note:	Includes a 1947 recording of Irving Berlin's anthem "The Freedom Train," for which various Capitol artists took turns in singing the song's lyrics. Peggy Lee and Margaret Whiting were the two female leads in the varied group. "The Freedom Train" can also be found in Peggy Lee anthologies and, as shown elsewhere through this page, in compilations by some of the other participating artists. 2. 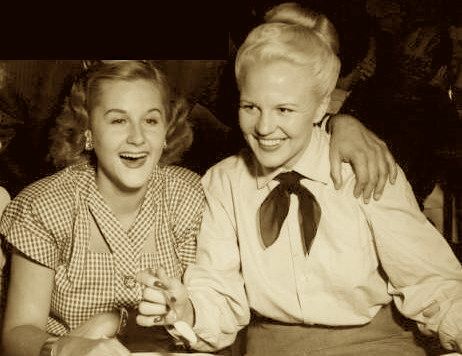 Photo of Peggy Lee and Margaret Whiting together, taken around 1947. 3. 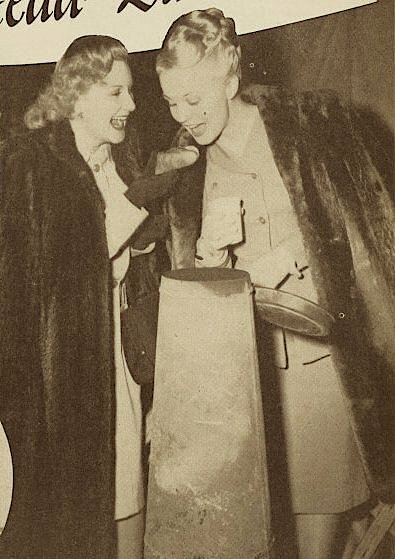 Peggy Lee and Margaret Whiting at a March of Dimes event, probably in January of 1948. Coats, an outdoor stove, a flying pan, one hot dog and a hot cup of coffee are also part of the equation. 1. Title: Mel Tormé Sings His Own California Suite / Format: 78-rpm Album & EP & LP / Label: Capitol / Cat. Num. : Edd 200 [8 28004-28007] & Kcf 200 (6F 28004-28007) & P 200 / Rel. Year: 1950 / Note: Peggy Lee appears under the pseudonym Susan Melton and plays the antagonist "The Easterner" in this paean to the West Coast. Her singing is heard (sometimes very briefly, sometimes at greater length) in the following segments of the suite: "We Think The West Coast Is The Best Coast," "Coney Island," "The Miami Waltz," "Got The Gate On The Golden Gate," and the reprise of "We Think The West Coast Is The Best Coast." 2. 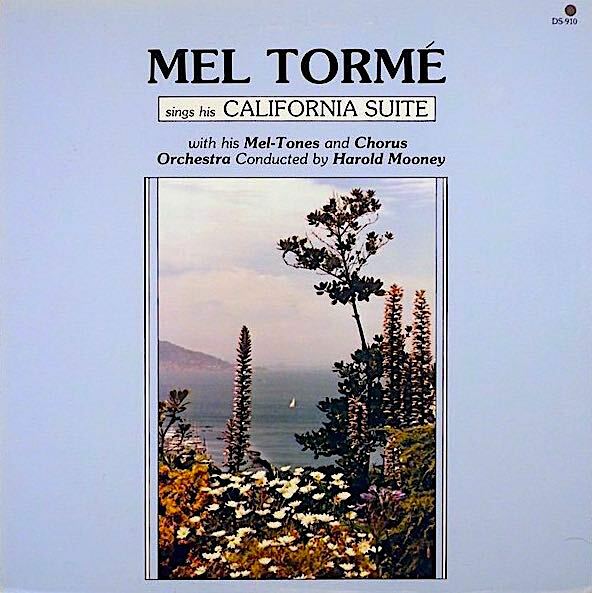 Title: Mel Tormé Sings His California Suite / Format: LP / Label: Discovery - Trend / Cat. Num. : Ds 910 / Rel. Year: 1984 / Note: Reissue of item #1. 3. 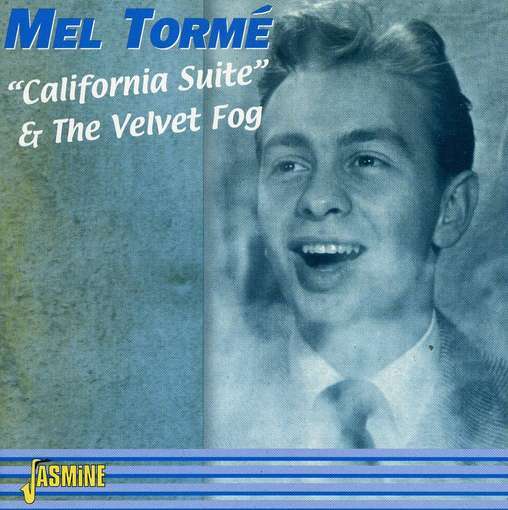 Title: Mel Tormé Sings His Own California Suite, Complete Edition / Format: CD / Label: Fresh Sound / Cat. Num. : (Spain) Fsrcd 496 / Rel. Year: 2008 / Note: In addition to the original version released by Capitol in 1950, Mel Tormé did a second version of his California Suite for Bethlehem in 1957. That second version does not feature Peggy Lee. Fresh Sound's compact disc includes both the Lee and the non-Lee versions of the suite. 4. Title: California Suite & The Velvet Fog / Format: CD / Label: Jasmine / Cat. Num. : (United Kingdom) Jascd 365 / Rel. 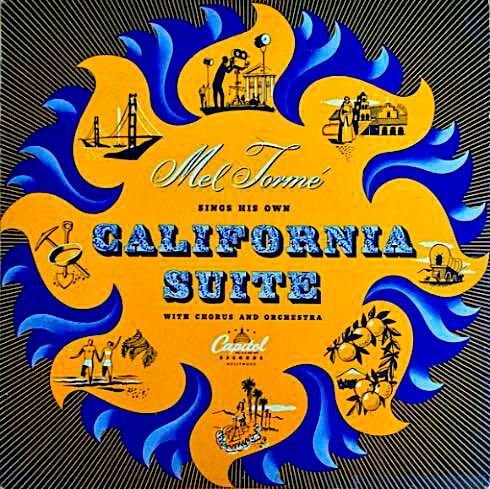 Year: 2000 / Note: Features Tormé's entire 1950 California Suite, originally released on Capitol Records. Also includes "The Old Master Painter," a hit duet that Peggy Lee and Mel Tormé recorded while both were under Capitol contract. 5. Title: Mel Tormé ("The Best Of The Capitol Years" Series) / Format: CD / Label: EMI / Cat. Num. : (United Kingdom) 0777 7 9 9426 2 6 / Rel. Year: 1995 / Note: Includes "The Old Master Painter" (1949) and "Don't Fan The Flame" (1951), two of the four duets that Peggy Lee and Mel Tormé recorded while they were under contract with Capitol. Not included were "Bless You (For The Good That Is In You)" (1949) and "Telling Me Yes, Telling Me No" (1951). As of 2011, both excluded duets can be found only in Peggy Lee anthologies -- not in Mel Tormé issues. 6. 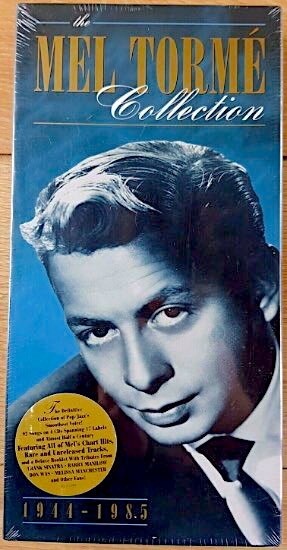 Title: The Mel Tormé Collection, 1944-1985 / Format: CS & CD / Label: Rhino / Cat. Num. : R2 71589 & R4 71589 / Volumes: 4 / Rel. 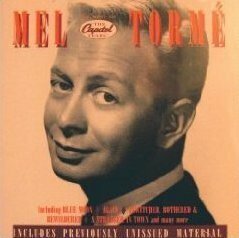 Year: 1996 / Note: Commendably encompassing, this career retrospective of Mel Tormé includes one number from his California Suite for Capitol Records. The number is "Got The Gate On The Golden Gate," and Peggy Lee is among those who sing in it. 7. Title: The Velvet Fog / Format: LP / Label: Emi's Drum / Cat. Num. : (Australia) drum 8193 / Rel. Year: 1976 / Note: Includes one of the Lee-Tormé duets, "The Old Master Painter." 8. 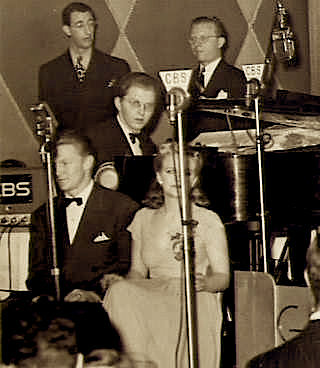 Publicity photo showing Tormé Shearing and Lee together in 1951 (as co-hosts of a television show). Some of the duets that Peggy Lee and Mel Tormé recorded for Capitol Records can also be found in other Tormé CD compilations, most of them in the Public Domain. Above, I have circumscribed my choices to official compilations and to releases from collector-oriented labels. 1. Title: Dragonfly Summer / Format: CS & CD / Label: Reprise / Cat. Num. : 9 45227 4 & 9 45227 2 / Rel. 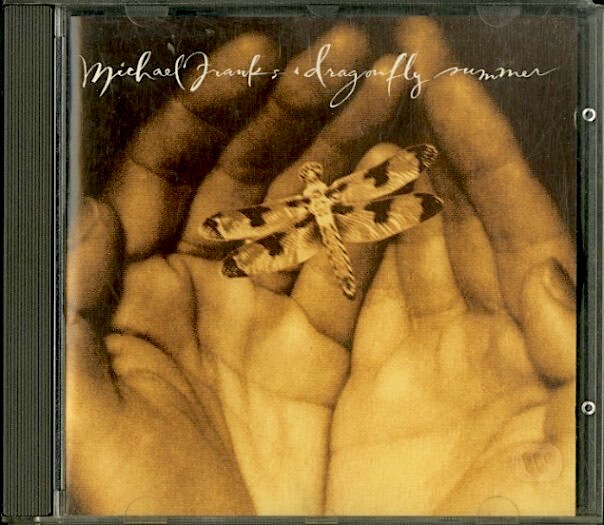 Year: 1993 / Note: This original Michael Franks album includes his duet "You Were Meant For Me" with Peggy Lee, which they recorded in 1992. The duet can not be found anywhere else -- neither in Lee's CDs nor in compilations of Franks' work. 2. Publicity photo, taken during the recording session. 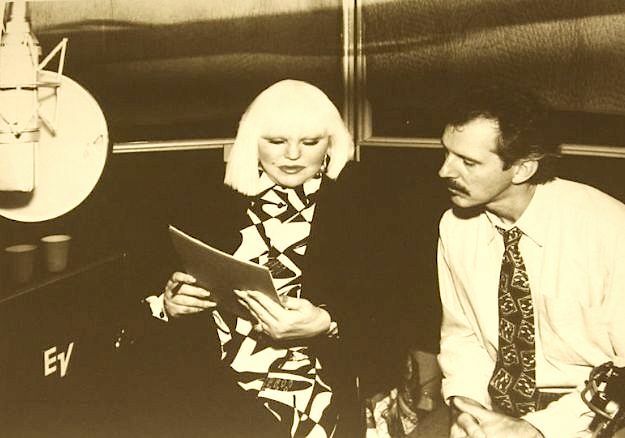 Under the picture, a caption (not included above) reads: "Legendary musician Peggy Lee confers with singer-songwriter Michael Franks during New York recording session. 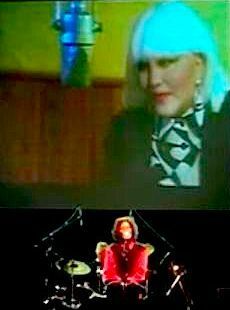 Miss Lee makes a relatively rare recorded appearance on the duet, You Were Meant For Me, featured in Franks' latest release, Dragonfly Summer. 1. Title: Straight Ahead! / Format: CD / Discs: 4 / Label: Jasmine / Cat. Num. : (United Kingdom) Jazzbox 31 / Rel. Year: 2014 / Note: This compilation features the 1954 duets "It Must Be So" and "Straight Ahead," which Peggy Lee and The Mills Brothers recorded for the Decca label on November 9, 1954. 2. 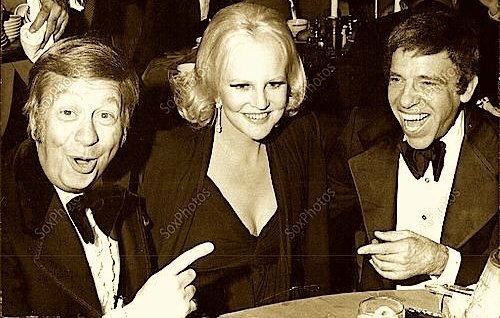 Photo of The Mills Brothers and Peggy Lee. Date and occasion unknown. Lee's looks suggest that the shot was taken around 1952. 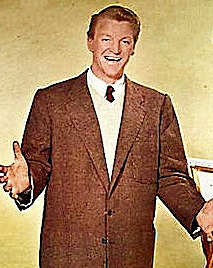 Both acts were Decca recordings artists (from 1952 to 1956, in Lee's case). 1. 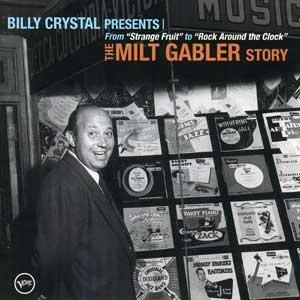 Title: Billy Crystal Presents The Milt Gabler Story / Format: CD & DVD / Label: Verve / Cat. Num. : B 0003911 00 / Rel. Year: 2005 / Note: This tribute to celebrated producer Milt Gabler includes Peggy Lee's hit recording of "Lover," which she and Gabler did while both were working for Decca Records (1952). Disappointingly, the liner notes of this issue have nothing to say about the collaboration. 2. 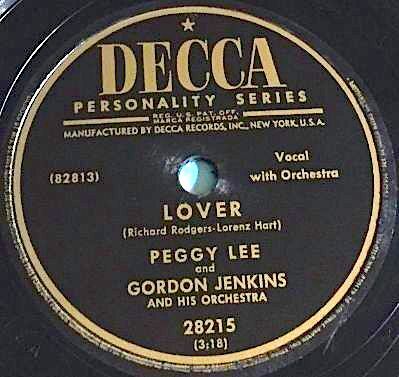 The Decca 78-rpm single on which "Lover" was originally released. 1. Title: 1. 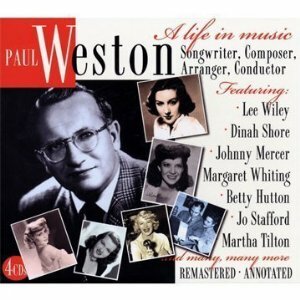 Title: Paul Weston; A Life In Music; Songwriter, Composer, Arranger, Conductor / Format: CD / Label: JSP / Cat. Num. : (United Kingdom) 957 / Rel. Year: 2009 / Volumes: 3 / Note:	Includes a 1947 recording of the Paul Weston-conducted number "The Freedom Train," in which Peggy Lee is among the Capitol vocalists who take turns in singing the vocal. This number can also be found in Peggy Lee anthologies and, as shown elsewhere through this page, in compilations by some of the other artists who were part of the session's personnel. 2. 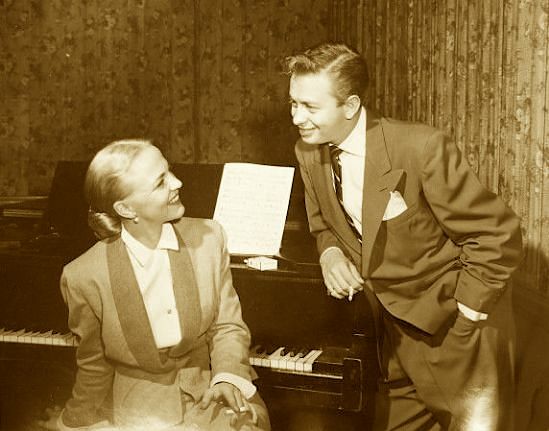 Peggy Lee with Paul Weston, in a photo taken in 1951 or 1952. 1. Title: The Pied Pipers ("Capitol Collectors" Series) / Format: CS & CD / Label: Capitol / Cat. Num. : C4 95289 & C2 95289 / Rel. Year: 1992 / Note: Includes a 1947 recording of Irving Berlin's "The Freedom Train," in which The Pied Pipers and Peggy Lee are among the Capitol vocalists who take turns in singing the vocal. This number can also be found in Peggy Lee anthologies and, as shown elsewhere through this page, in compilations by some of the other artists who were part of the session's personnel. 2. Title: Dreams From The Sunny Side Of The Street / Format: CD / Label: Jasmine / Cat. Num. : (United Kingdom) 412 / Rel. Year: 2005 / Volumes: 2 / Note: Includes the same performance mentioned in entry #1. 3. In the photo shown below, the four members of the Pied Pipers are by the microphone, leaning on the piano. Peggy Lee is nearby, with Benny Goodman standing in-between. The other standing individuals are Johnny Mercer and Margaret Whiting. Paul Weston is at the piano. Coincidentally or otherwise, each of these Peggy Lee mates happen to have their own entry in this page -- with the exception of Benny Goodman, for whom separate pages have been prepared in this Peggy Lee discography. The pictured meeting of artistic minds took place at the request of the label to which all of them were contracted, Capitol Records, on September 12, 1947. The session had as its primary objective their joint recording of a then-brand-new patriotic tune, from the pen of Irving Berlin. 1. Title: Q; The Musical Biography Of Quincy Jones / Format: CD / Label: Rhino / Cat. Num. : 74363 / Volumes: 4 / Rel. Year: 2001 / Note: This Quincy Jones retrospective includes one track sung by Peggy Lee, "As Time Goes By." That track is from If You Go, one of the two albums that Jones arranged and/or conducted for Lee in 1961. 2. 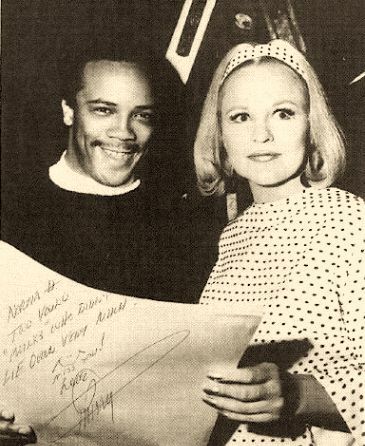 Photo of Peggy Lee and Quincy Jones at a recording session. 1. 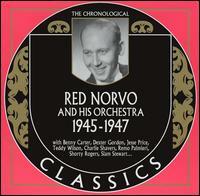 Title: The Chronological Red Norvo And His Orchestra, 1945-1947 / Format: CD / Label: Classics / Cat. Num. : (France) 1386 / Rel. 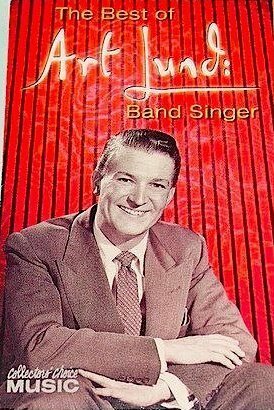 Year: 2005 / Note: An all-star roster got together for a 1947 Capitol date that resulted in "Ja-Da" and "Three-Thirty Jump," both instrumentals that are included in this Red Norvo CD. Each of the 11 participating musicians played an instrument different from the one for which they were best known. Peggy Lee was the drummer, Red Norvo the pianist, and the ensemble was baptized as Ten Cats And A Mouse. 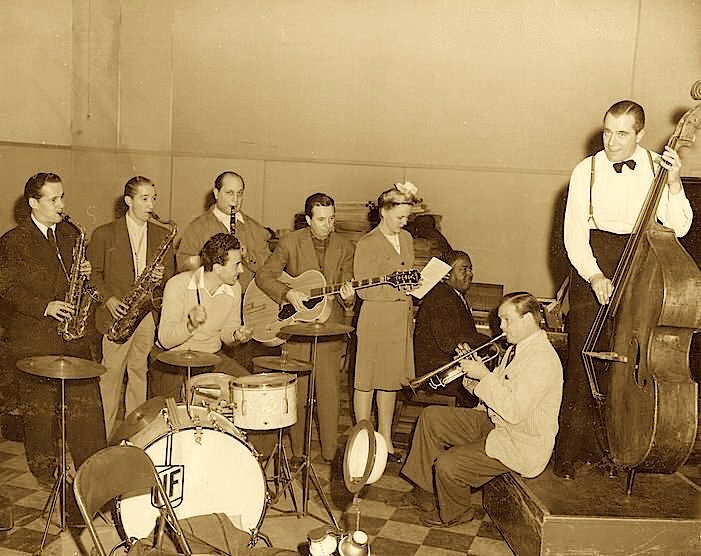 Although Capitol conceived the record as nothing more than a fun novelty, the ensemble's playing proved good enough to be taken seriously by both the press and the radio stations. Of the two instrumentals, only "Three-Thirty Jump" has appeared in a Peggy Lee compilation (Capitol's so-called pink box, Miss Peggy Lee). As for "Ja-Da," it can be found in the original 78-rpm single, in this Norvo CD, and in a couple of various-artists compilations. 2. Photo. 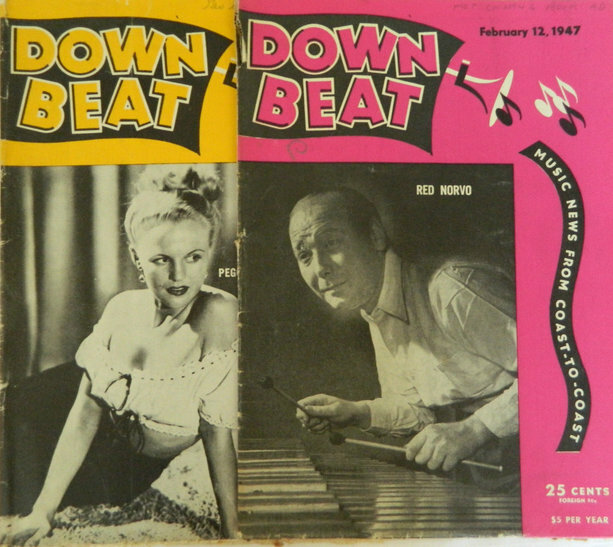 Front covers of two February 1947 issues of Downbeat magazine, one featuring Peggy Lee, the other Red Norvo.